The referee’s ruling on a play is final. The Al-Wahda Tournament Committee Officials reserve the right to modify these rules at any time. 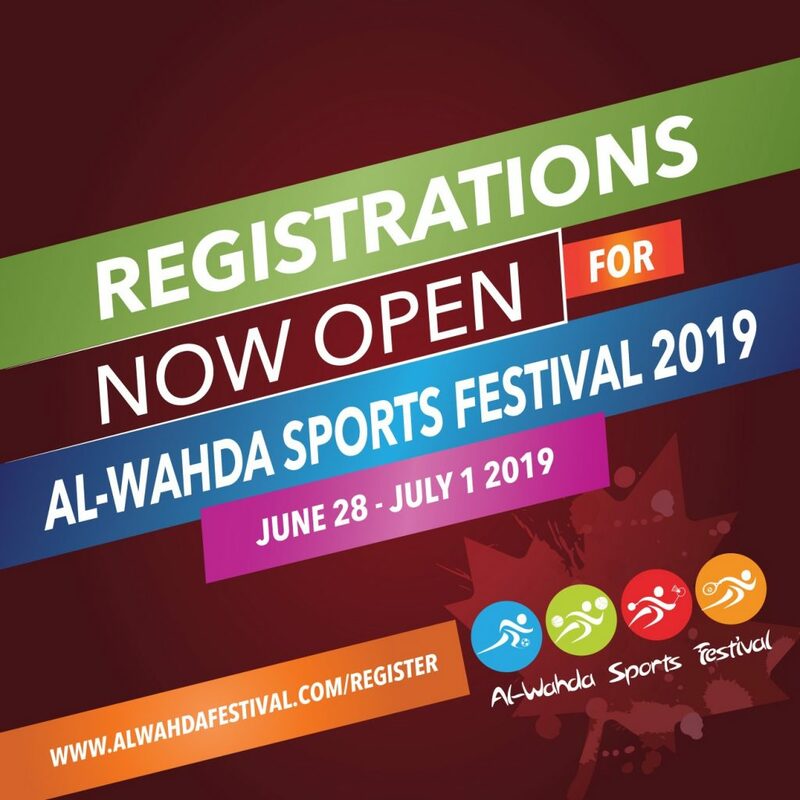 All players registered in the Al-Wahda Sports Festival must be of the Shia Ithn’Asheri Faith. Any individual found to be in violation of this rule, will be immediately disqualified from the festival. In the event, the individual is part of a team, the entire team will be disqualified from the competition. Each team will consist of 6 players, with a maximum of 8 players per roster. Teams will have a 5-minute grace period to present the minimum number of players for their allocated game. A minimum of 4 players must be present on the court for the game to begin. Failure to be present will be considered a forfeit and award an automatic win to the opponent, with a score of 25-0. Referees decision is final and ALL players must respect the decision of the referee and linesmen. During the game, all communication with the referee must be done through the Team Captain only. The playing court is a rectangle measuring 18 X 9 m, surrounded by a free zone that is at least 1m wide on all sides. Net height will be 2.24 m, measuring from the top of the net. The referee will call the captain of both teams to conduct a coin toss. The winner of the toss chooses EITHER the right to serve or receive the service, OR the side of the court. The side losing the toss shall then exercise the remaining choice. The team’s starting line-up indicates the rotational order of the players on the court. This order must be maintained throughout the set. After the service hit, the players may move around and occupy any position on their court and free zone. When the receiving team has gained the right to serve, its players rotate one position clockwise. 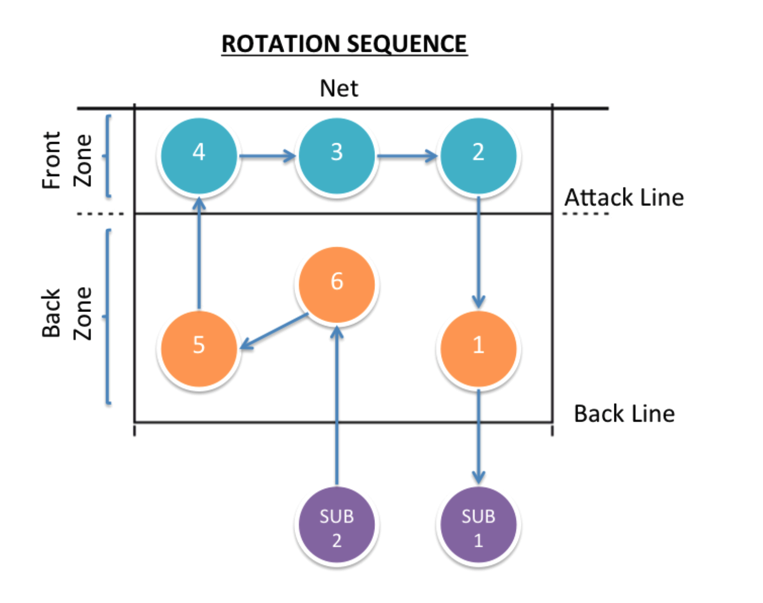 Substitution will occur when the receiving team wins the rally, during which the substituting player will rotate into position #6, as long as a consistent rotational sequence is maintained throughout the game. The Rally Point System will be in effect, where the winner of the rally scores a point and gains the serve. The first team to score 25 points with a minimum lead of 2 points wins the set. Play is continued until either a victory with a 2-point lead is achieved or when the 15-minute time limit is reached. All games will be 1-set matches except for the finals, which will be best of 3 matches. In order for a backcourt player to complete a legal attack/spike, they must be behind the attacking line and make contact with the ball when it is lower than the top of the net. This ensures that backcourt players are not taking off while completing an attack hit. Each team must play within its own playing area and space. The ball may, however, be retrieved from beyond the free zone. The ball is “out” when it touches an object outside the court, the ceiling, the wall, a person out of play, or crosses underneath the net. The team is entitled to a maximum of 3 hits (excluding the block) for returning the ball. Hits include intentional and unintentional contact with the ball. A player may not hit the ball 2 times consecutively. Two or three players may touch the ball simultaneously, but it is counted as two or three hits (with the exception of blocking). The ball may touch various parts of the body, provided that the contacts take place simultaneously. During game play, the ball cannot be caught and thrown or lifted with an open palm. In best of 3 match games, the first service of the first set will be executed by the team determined by the toss. The other sets will be started with the service of the team that did not serve first in the previous set. There is a maximum of 5 serves per player. After 5 serves have been completed, a clockwise rotation will take place. When the receiving team wins the rally, it gains the right to serve and rotates before executing the serve. An underhand or overhand serve can be performed. The ball shall be hit with one hand or any part of the arm after being tossed or released from the hand. Only one toss or release of the ball is allowed. Failure to do so will result in the loss of service and with the allocation of a point to the opposing team. Contact with the ball must be made with both feet behind the service line or a fault will be called, and the opposing team will win the point. The server must release the ball within 8 seconds. Individual or collective screening, which prevents the opponent from viewing the server or the flight path of the ball, is not permitted during a serve. In blocking, the player may place her hands and arms beyond the net provided that this action does not interfere with the opponent’s play. It is not permitted to touch the ball beyond the net until an opponent has executed their play. A block contact is not counted as a team hit. A team is entitled to 3 hits to return the ball after the block contact. The first hit after a block may be executed by any player, including the one who touched the ball during the block. Blocking an opponent’s service is not permitted. After an attack hit, a player is permitted to pass her hand beyond the net, provided that the contact has been made within her own playing space. Contact with the net by any player is not a fault unless it interferes with the play.The interference of play is considered to have taken place when the players in the vicinity of the active ball, who are attempting to play it, make contact with the net. In this case, contact with the net will be deemed a fault.